Innovative technologies open up additional possibilities for addressing potential customers in existing channels or offering new channels. In the online competition for traffic and conversion, companies must implement sustainable strategies in order to survive in the market. An essential part of this strategy is the search function in the online shop, and the way products are presented to the customer. 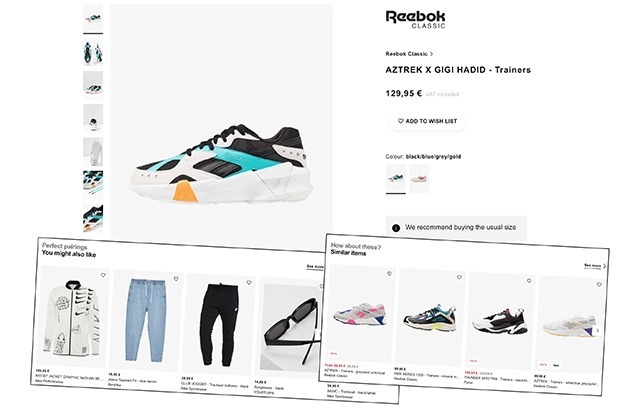 In Part I of his two-part series, Fabian Engeln from for​you​and​your​cu​sto​mers describes what distinguishes successful Search & Merchandising in e-commerce. During recent years, the omnichannel consultant from Munich has supported companies throughout Europe in the implementation of numerous e-commerce projects, with a focus to add value through enabling a mature Search & Merchandising function. Now, he also offers that expertise to companies in Australia. In practice, mastering certain Search and Merchandise functionalities and processes have shown to make online retailers successful. An important component is the search function in the online shop, and the way in which products are presented to the customer. In the following, we will take the example of Sophie, a persona who is actively involved in the purchase of a coffee machine, and will take a closer look at four important cornerstones of successful Search & Merchandising. Bakker’s flyout with a large number of suggestions that go beyond the entered search term. As soon as Sophie clicks into the search box, she expects to see search suggestions based on trending keywords in a flyout menu. Then when she starts typing, she expects suggestions which are relevant to her input only. She likes to be inspired by a variety of suggestion types such as search suggestions, products, categories and content. Suggestions for misspelled words offer Sophie added value and supports a seamless search experience. An example of the Suggest variety can be seen on Bakker.com. When Sophie searches for a product in a supplier’s online shop – using the existing product number – or by keyword such as “coffee machine”, she should only see the products that match exactly. In addition, companies should also be able to make incorrect inquiries possible by displaying the same hits when searching for “cofe machine” as when searching for a correct spelling. Sophie also expects an online retailer to provide a relevant product selection when searching for more specific descriptions such as “suitable for all cups and glasses”. If she searches for independent terms, for example “coffee machine, tea machine”, she would also like to get matching results for the individual terms. This way, she can decide for herself which product list to use to continue her evaluation process. SportCheck.com efficiently implements this by displaying two product lists in such a search. Product lists should contain the most important information for Sophie’s further search, but should not be overloaded. My experience has shown that potential customers primarily expect information about availability, price, promotional badges, product titles and appealing product images in their search process. In our example, Sophie expects the most relevant products in the upper product slots. These expectations can be met via ranking rules based on a combination of marketing, commercial, behavioural and logistical information. For example, commercial data can include the number of product views, clicks, add-to-baskets, sales and click-through rates per product. Furthermore, when Sophie uses appropriate filtering options, she wants to see useful, understandable and visually appealing results to intuitively navigate further. Accordingly, companies can make the search journey more visually appealing for customers like Sophie with sliders or colour icons in the colour filter. 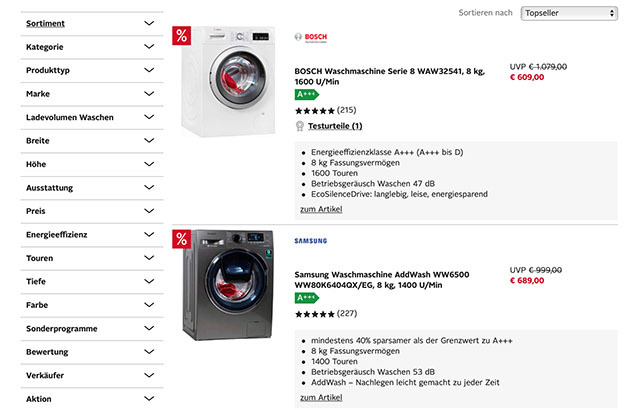 One example is Otto.de, where they display a balanced mix of product details on the product list, as well as filters relevant to the products for a search for „washing machines“. With their wide product range they have managed to make the product list as specific as possible for the user context. Campaigns can provide Sophie with further helpful ways to gain access to products. These can be displayed in the form of product sliders on pages such as the homepage, product lists, detail pages and shopping cart, for example. 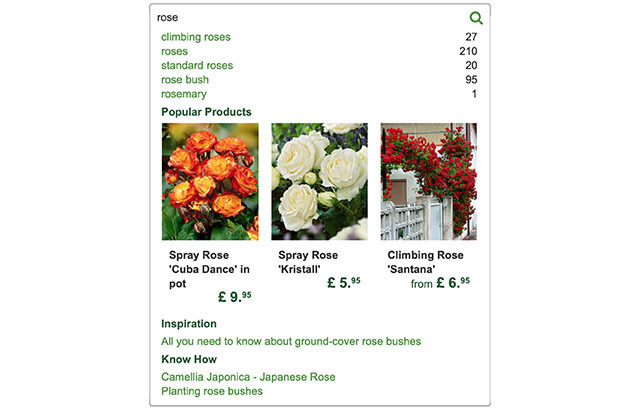 Depending on the page type, companies should adequately configure the algorithms for displaying products. Sophie may also be inspired by bestsellers or sales articles on the homepage. Practical tests have also shown that potential buyers like Sophie often find product alternatives offered on detailed pages of out-of-stock products very helpful. 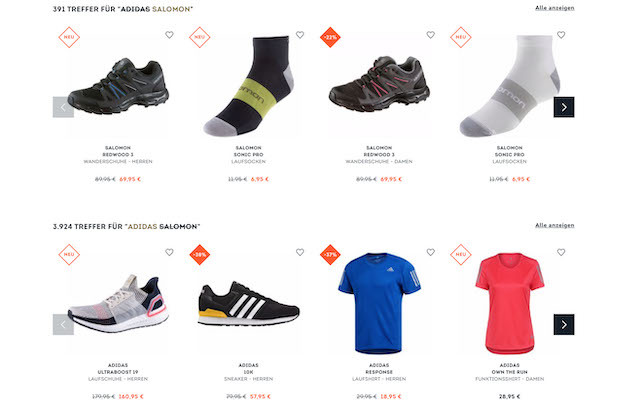 An example for good product recommendations is Zalando.de, which displays alternatives as well as matching products as outfits on its product detail pages. In order to be able to offer these functionalities, a continuous optimisation process within a company is required. Companies should track when users like Sophie search for a product in their online shop and get zero results. It is also important to get an overview of Sophie’s favourite search terms. Companies should regularly check their analytical reports and use these insights for optimisation. Quick wins can be achieved by configuring result modifications, synonyms and redirects. Furthermore, a close cooperation between the search owner and other teams is necessary. For example, by collaborating with the online product management team, the product catalog can be optimised based on Sophie’s feedback. Moreover, regular monitoring of relevant search KPIs supports these processes. 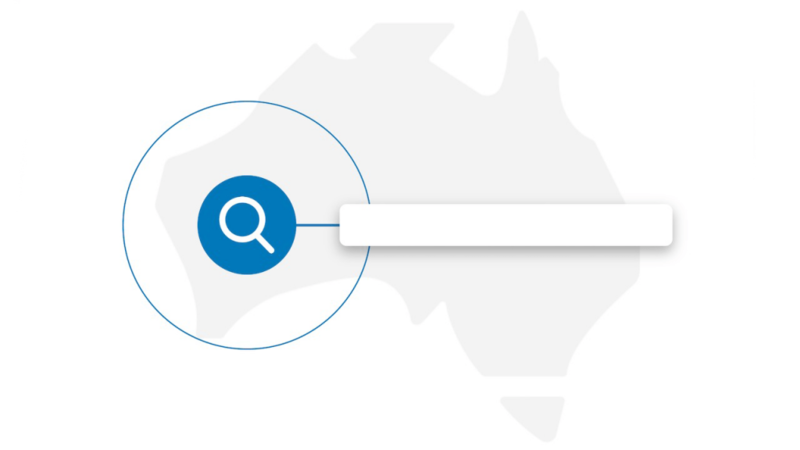 An implementation is often successful if capable cloud solutions such as Attraqt Fredhopper are used in the search area, as this simplifies the creation of business rules via a clear interface. From my experience in e-commerce I can conclude: Only when these cornerstones have been implemented, companies have reached a baseline for successful Search & Merchandising and can ultimately win potential customers like Sophie as customers. In my upcoming contribution, I’ll address the question: What could inspire Sophie in the field of Search & Merchandising in the future – in times of ever faster digitalisation and ever shorter technological development cycles? Innovative technologies open up additional possibilities for addressing potential customers in existing channels or offering new channels. Fabian Engeln has been with foryouandyourcustomers in Munich with great passion and commitment as an integral part of the Search & Merchandising team for a long time. He has successfully supported international online retailers and B2B companies in developing processes, building a search organisation and continuously optimising their systems. Since moving to Australia, he now works closely with Bernhard Mueller, Managing Director in Australia, as well as company founder Jonathan Moeller. 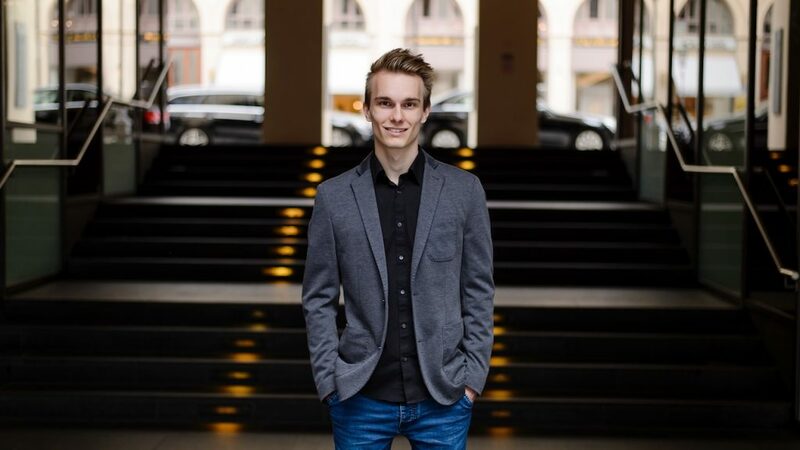 Based on his experience gained in numerous projects, Fabian Engeln is responsible for offering foryouandyourcustomers expertise in Search & Merchandising to companies in Australia. If you also need support in establishing the cornerstones for successful Search & Merchandising, optimising your business in this area or want to learn more about future-oriented technologies in e-commerce, please contact the author at [email protected].